Links to audio and video below. The 50th anniversary of Yuri Gagarin’s UK visit was marked by the unveiling of an aluminium statue of Gagarin, an exact copy of the one outside Lyubertsy Technical School number 10 where Gagarin started his training as a foundryman. 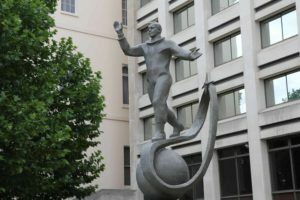 The statue, a gift from the Russian federal space agency Roscosmos to the British Council, is located outside the British Council Offices in London but only for one year. Derek Pullen who provides a brief description of how the statue came from Moscow to London. Nataliya Koroleva. 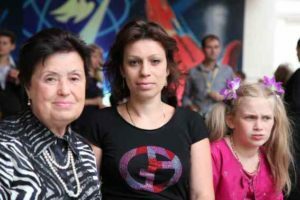 Chief Designer Sergei Korolev’s daughter. Who gave me a gentle rebuke whilst looking through my book “Yuri Gagarin in London and Manchester” and seeing a photograph of Wernher von Braun and Herman Oberth but not of her father! The episode ends with Ambassador Yakovenko briefly recalling his recent meeting with the queen.